Many Indian Children are denied access to basic needs due to extreme poverty. Our Community Based Child Care Centers are havens where impoverished children, aged 3-18,experience God’s love and receive food, clothing, medical aid, education and English classes so they are equipped to thrive. We empower their families through support and education. Our Children’s Program is a safe loving place for impoverished children who live at home to come to our center to receive food, clothing, transportation to school, tutoring, English instruction, and medical aid. The Center also helps the community-at-large by promoting health & hygiene classes, literacy training and social entrepreneurism classes to the parents. 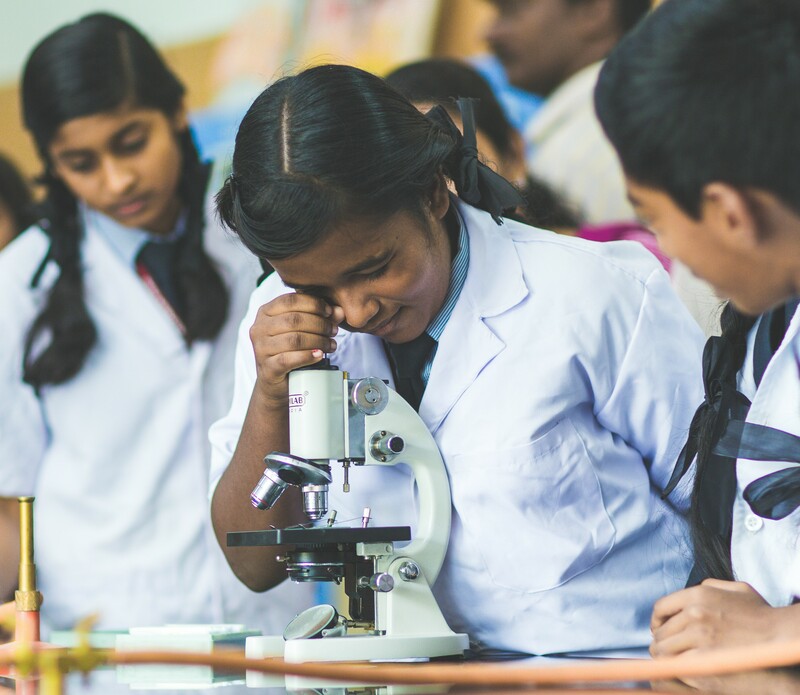 The school year has started in India; however, we receive student sponsorship requests all year long. We will select a student for you and send you the child's profile. 01/01/2010 - Asish is a smart little boy, active and likes to learn anything that's taught in preschool. In preschool he enjoys playing with peers. He and his four sisters and the parents are living in a small hut, which is built with mud and rudimentary stones. The father is a street cobbler. He is not able to earn more than US $40 a month on an average and this income is too low for a family to make a decent living. As a result, Asish and the other children are not able to receive proper care in terms of food, health care and other necessities that are important for children growing up. In order to help him achieve his potentials and help him see a good future, a sponsor's support is vital. Sponsoring this child will enable him to have access to nutritious food every day, better health care and educational support. 11/14/2010 - Girija comes from a very poor family. Her father works as a daily wage earner outside the city, in the surrounding villages. His wages are very low, but survival makes it necessary to work even in far off places. The earning that he brings home late night is the only source that the child's mother has to depend on for cooking food till the next day evening. The family lives on daily income and sometimes the hostile weather conditions will deprive the day's income. The child's mother is so helpless and tries to manage household. 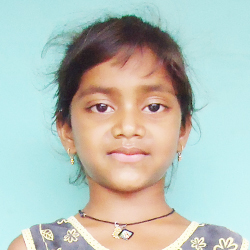 The parents are very happy that Girija shows lot of interest in going to school and in learning her lessons every day. UEM felt that poverty in the family cannot deprive the child from getting good education as school dropout rate is high in these poverty stricken slum. UEM is all for extending a helping hand to this child through the sponsorship program and together with a sponsor's support Girija can really become an educated person in the years to come. Your kind sponsorship and your decision to support will make this dream come true for the child. 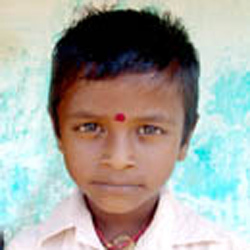 06/24/2008 - Jagaveera Pandian is a smart little boy, studying in primary school. He has three sisters older than him and they are studying in school. He comes from a remote village and the family lives in a small improvised hut in absolute poverty. The parents sometimes go to work in the agricultural fields as laborers and sometimes they do not get jobs and together they are able to earn an average income of $ 40 a month. In spite of poverty, the parents forgo most of their own needs and send their children to school and try to supply their school needs. But it has been extremely difficult for them to meet their basic needs and other necessities. Now, in order to give the child opportunities for education, good nourishment and health care through the welfare programs of UEM, he would need to have a sponsor. Your sponsoring this child will help changing his life and future. 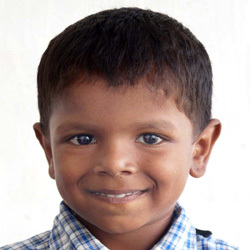 11/15/2008 - Kabilan, the little boy in primary school, comes from a village and he lives with his father, mother and a sister. The family lives in a single room house that has cemented walls and dry palm leaves strewn over as a roof top. Kabilan's father is a freelancer electrician who attends to repair works whenever somebody calls for him. In the village his chances of getting frequent jobs is remote and so, his earnings are very meagre and uncertain. 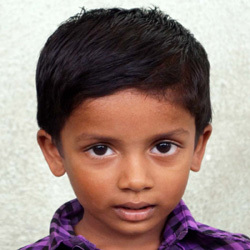 Kabilan's mother is a home maker and is struggling hard to make ends meet. 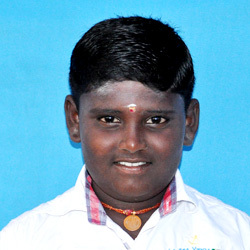 Upon the earnest request of Kabilan's mother, UEM has enrolled Kabilan to be a part of the sponsorship program. 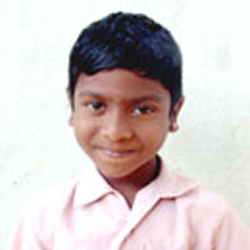 In order to support Kabilan in his education and welfare, UEM looks forward to get his name signed up by a sponsor. Sponsorship program will provide not only for his education, but a nutritious food and evening snacks every day. He will also have access to extra tuition after his school hours. 08/19/2011 - The parents of Lathanya are village folks who live by hard means. Despite poverty, their intention is to give Lathanya a good education in an English medium school. The child’s father is a cook for the laborers who work on digging bore wells. The wages are low and uncertain, because he gets jobs only when there are orders for the bore well company. The family is living through poverty and educating the child and to provide for her necessities has been a difficult task for the parents. Yet they do not want to compromise on child’s education. At this time, UEM’s intervention with a sponsorship program brings in some hope for the parents that their child will have continual educational opportunity and better care. Now, without a sponsor for the child, bringing a change in child’s life will be challenging for UEM. It is the person who is going to sponsor the child makes all that difference. A sponsor's kind considerations not only gives the child a good education, but nutritious food , health care, and spiritual guidance. 08/30/2009 - Pragadheeshwaran is a wonderful child with friendly qualities. He enjoys playing with peers. He comes from the most backward community who are known as 'Dalits' or the labor class of people. The parents are the farm laborers and their daily wages are low and irregular and they cannot even make US $ 50 a month and that means they are just surviving with bare needs. The family is living in a small hut built of mud walls and the roof covered by palm leaf thatches. It is a small place inside the house, and hardly anything can be seen valuable, except for few kitchen utensils, few tumblers and some plastic wares and pots. In order to care for the child with proper nutritional support, health care and educational support, he needs a sponsor. Your sponsorship will make a big difference in the life and future of this needy child. 02/06/2007 - Prasath's family lives in below poverty line. The father and mother are farm laborers who sweat out the whole day to earn an income of $30 - $40 a month that's hardly sufficient to meet even the bare needs.. The parents do not get jobs on a regular basis and at times they have to wander searching for jobs in the neighborhood. Living in below poverty line, the parents cannot afford proper care and nurture of the children. Prasath, adjusts well with the family's difficult situation and goes to school regularly. He likes to get good grades and wants to become well educated in future. 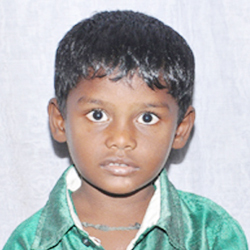 Prasad needs encouragement and support through sponsorship program. Your valued support as a sponsor will give hope to their poor lives and also help Prasath to enjoy some of the essential needs that he misses in his life. 10/15/2011 - Raja Tamil Mallan comes from a family of five and that include his parents, two sisters and a brother. Raja's father is a farm labourer and the mother a house wife. Living in a small hut in the village, without proper household things and amenities around, life has been much harder for them. The child's father has to look for jobs every day in the farms and providing three square meals a day to the family is all depended on how much the father brings home at the end of day. He also has the habit of drinking after a hard day's work. Raja's mother is a house wife and feeding their four children is a herculean task for her. In spite of poverty, the child's mother doesn't want her children to get dropped out of school and sacrificially does all that are necessary for their schooling. Raja Tamil Mallan is studying in primary school and never does he stop going to school nor does he keeps his school works pending. His parents are proud of him. UEM wants to keep up the spirit of this boy and help him have the continual opportunity for studies. A sponsor coming forward to support this child will be a hope for his life and make him a potential supporting member of the family in future. 2/15/2013 - Sabeen is a little boy studying in pre-school. He likes to go to school every day and enjoys the company of his peers as they learn and play together. Sabeen writes and practices at home about everything that is taught in school. His father is a laborer in a welding shop for meager wages and the mother is a home maker. The family lives in a small house in the village in acute poverty and their economic status doesn't ensure proper nourishment for Sabeen and his little brother. UEM has enrolled the child's name for sponsorship assistance that will help Sabeen to look forward to continual opportunity for education and better nutritional care. Under the sponsorship program, Sabeen will be entitled for nutritious food at lunch time and snacks in the evenings. He will also be provided with extra-tuition by the teachers appointed by UEM. Sabeen will have the opportunity for his overall development through your kind sponsorship. 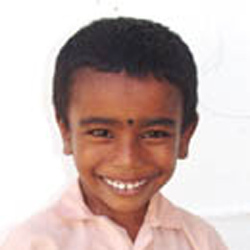 03/18/2010 - Sudhakar is studying in primary school and is doing well in all the subjects. He is learning English and enjoys schooling. 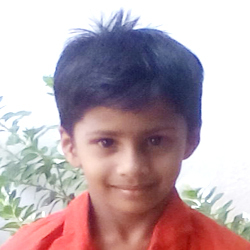 Sudhakar likes to draw pictures and loves to play with his friends. His father is a ticket collector for a private bus owner in the village. He gets a small salary of about $ 50 a month. Apart from his two children, the father has a large family to care, his aging grandparents and inlaws. Financial difficulties have often been a threat for children's education with the increasing number of school dropouts from these poor communities. UEM's intervention to support this child will avert a possible school dropout. Through the sponsorship assistance the child will have continual education opportunity together with nutritional and healthcare support. A sponsor's love and support can bring about a lasting change in this child's life and future. 08/15/2003 - Vikram lives with his father and mother. At home his duties include running errands and fetching water for his mother. Vikram has two sisters and two brothers. The father is a casual labourer in the market. His wages are very low and irregular. He goes jobless most of the time in a month and that puts him in great hardship. The mother is sickly and she cannot work anywhere, except for looking after the household. The extreme poverty situation deprives children of sufficient food, clothing and healthcare. Vikram needs a sponsor to support his well being and education through the welfare programs of UEM that provides him with a nutritious meal every day, extra tuitions, educational supplies and health care. Can you help change his life?